Walking with Jesus: Romans, Day 21: Romans 8:12-17 - Why Must We Kill Sin? How Can We? Romans, Day 21: Romans 8:12-17 - Why Must We Kill Sin? How Can We? 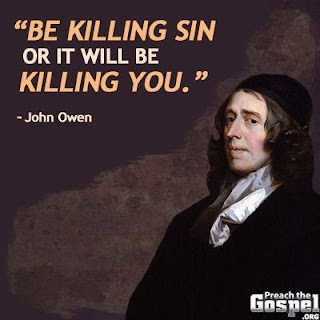 Why Must We Kill Sin? How Can We? The Christian life is a life-long battle against sin. Many people would like to pretend or teach otherwise. In fact, some people would look at what has been written so far in this post and scream "legalism!" But it's not legalistic; it's reality. Those of us who love the Lord and have been called to faith in Christ struggle with sin and against sin for the rest of our lives. 1. Sin is a destructive distortion of God's good creation. Sin is a cancer, a distortion of all that God has made to be good and right. Sin takes God's good gifts- pleasure, power, relationships, food, money, etc. - and twists them toward corrosive ends. 2. Sin is enslaving. Sin is addictive and enslaving. Satan uses sin to trap us and fool us into doing his will, even to our own hurt. Long after sin stops keeping its promises and ceases to be enjoyable, it holds us firmly in its grip. 3. Sin is offensive to God. God hates sin, and if we love God we must hate sin, too. God hates sin because it mars and corrodes His good creation. It leads His loyal subjects into disloyalty, distorts His truth into error, enslaves His children to futility and divides His kingdom into petty factions of self-interest and folly. We must learn to hate sin for the very reasons that God hates it. 4. Sin short-circuits our fruitfulness and effectiveness. How many ministries have been derailed by sin? How much Christian testimony has been short-circuited by hypocrisy? How many Christian marriages have been destroyed by deception, resentment and infidelity? How many children raised in the church and in Christian homes have walked away from God because of the sin they have seen in their parents and church leaders? 5. Sin is contrary to God's holy character. Believers are being transformed into the image of Christ, who is the perfect reflection of God's holy character. Sin is contrary to God's holy character and thus contrary to God's redemptive purposes for us in Christ. 6. Sin poisons all of our relationships. Every relationship we have has been and is being poisoned in some way by sin: in the church, at the workplace, in the home, in friendships. We see again and again the effects of pride, envy, covetousness, resentment, distrust, lust, deception, worry, insecurity and gossip in all relations. If we love people and value our relationships, then we must hate sin and seek to uproot and destroy it. 7. Sin shipwrecks and kills even professing believers. Ultimately, we have all been eye-witnesses to the power of sin to shipwreck and destroy professing believers. We cannot always know the eternal destiny of these professing Christians. We cannot know if they were false professors or sincere believers who became overcome by besetting sin. But the Bible makes it clear that professing believers are destroyed by sin either as a final act of Fatherly discipline or as a way of revealing their hypocrisy to the world. 1. We kill sin only by the power of God. We are powerless over sin in our own strength, but God has the power to make us strong and holy. To fight sin in our own strength is not only folly but also pride and thus sin. 2. We kill sin through the application of the Gospel of Jesus Christ to our lives. As we remember who we are in Christ, recall the wonder of our redemption, meditate on all of the Gospel promises of God and seek to know Christ more and more, our motivation and empowerment toward true holiness grows. 3. We kill sin through radical self-denial and preventative measures. Yet we must also be very practical and even ruthlessly so. If we know ourselves and our tendencies toward temptation and sin, we must radically cut off the easy avenues and build barriers to sin wherever possible. This might mean going without certain things we enjoy or think we need. So be it. The victory is worth the sacrifices. 4, We kill sin in confession to one another. Most of us like to have people like us and think well of us. Often, this can keep us from confessing our sins to each other for fear or looking bad, losing face or being ashamed. We sinners need to confess and pray for each other. 5. We kill sin in prayer. We pray in earnest alone, with and for each other in pairs and small groups and together as a body of Christ in corporate worship. God hears and answers and heals and forgives. 6. We kill sin through the Word. The Word of God lays us open and exposes our sin and also brings the remedy of forgiveness for our sin. It shows us Christ our Redeemer and gives us wisdom for living well. We need to read, meditate, study and ponder the Word daily, faithfully, and regularly together with other believers. 7. We kill sin in worship and fellowship with other believers. No battle is ever fought by one soldier alone. The body of Christ is not made up of one member alone. We are called to each other and we need to worship, fellowship, pray, serve and live life together. Killing sin is a life-long calling and many times we can feel overwhelmed and defeated by the unfinished task. In those moments, we need to remember that God is faithful and that this is His work. He is not finished and He never lets go of us!